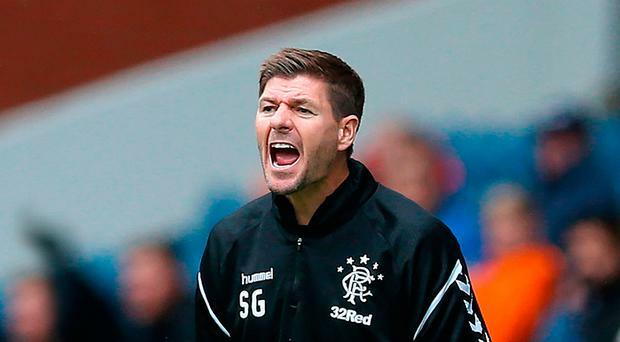 Back in Glasgow, looking composed just a few hours after his nine men walked the line in the Republic of Bashkortostan against FC Ufa as Rangers reached the Europa League group stages for the first time in a decade, Steven Gerrard delivered a concise, quietly robust assessment. "We feel like we're building something special here," stated the Ibrox manager. Under Gerrard's intensely fastidious regime, Rangers have achieved their first objective in what seems like a New York minute. A set of autumn clashes against Spartak Moscow, Villarreal and Rapid Vienna are warm reminders of the territory the club believes they are entitled to be in. The Gers' Group G place was achieved the hard way - mirroring Gerrard's own, unrelenting character in a sense - by successfully negotiating trips to Macedonia, Croatia, Slovenia and Russia. Extraordinary considering the Liverpudlian only checked in for official duty on June 1. Those comments about invigoration and being on the precipice of good times are not dissimilar echoes of Celtic two seasons ago, when Brendan Rodgers arrived at Parkhead to enhance a club standing still, if nothing remotely like the wreckage of Rangers' recent past. A 'double treble' later, boss Rodgers - currently on the brink of the sudden sale of striker Moussa Dembele - faces former Liverpool captain and confidante Gerrard for the first time tomorrow. Simple brush strokes by Celtic last spring were all that was required to humble their woeful rivals. Nine goals, without reply, across two one-sided games. Yet these acts of gratuitous punishment ultimately tend to galvanise the opponent into radical change by necessity and, in Rangers' case, the decision to go with inexperienced Gerrard came at considerable risk. A dozen games in and undefeated is a impressive statistic that tends to vindicate Light Blues chairman Dave King's calculations when he set about identifying a big name successor to Graeme Murty and Pedro Caixinha. Forging ahead in strenuous circumstances against Ufa on Thursday has seen Gerrard's radicalised outfit come of age. Gerrard was certainly relieved to observe new signing Kyle Lafferty work tirelessly up front, with the Northern Ireland international particularly determined to impact at Ibrox second time around. However, their big test of character rests at Parkhead. In Thursday's 3-0 Europa League play-off victory against Lithuanians Suduva, Celtic were in full flow, and Leigh Griffiths' 100th goal for the Hoops offsets some of the bubbling discord. The instincts of Rodgers, a shrewd judge of character, have been proven over wilful Dembele. The Frenchman was noted for his extravagance and goals, but his imminent sale does at least make fantastic business sense. Celtic are poised to rake in €20m from Lyon following an original £400,000 outlay in June 2016. The trouble is, the manager must wait until January to spend any of this income. Celtic will cope even though Rodgers remains unhappy about the lack of significant transfer activity sanctioned by chief executive Peter Lawwell. The late recruitment of free agent Youssouf Mulumbu and on-loan Leicester City defender Filip Benkovic has been met with a predictably lukewarm response by Hoops fans. Any post-Dembele landscape will see the attacking focus shift upon Odsonne Edouard, who has already netted a winner in this fixture. Rodgers is going to put increased trust in his £9m marquee signing. Goal potential can arrive from various quarters. Rodgers rested James Forrest and Tom Rogic against Suduva with tomorrow in mind, the type of luxury Gerrard doesn't quite have at the moment. Unlike Rodgers, Gerrard has no issues regarding recruitment. Incredibly, 14 players have arrived, five on loan, with Albanian winger Eros Grezda and Nottingham Forest defender Joe Worrall bookending the busy Ibrox spree. Injured loanee midfielder Lassana Coulibaly will be a key absence however. Is Alfredo Morelos a risk worth taking, in light of his Ufa red card? Or will Gerrard opt for Lafferty instead, with his novel ability to successfully roll Celtic, as seen recently in Hearts colours? Visions of Gerrard outmanoeuvring his old mentor would elevate his reputation quite considerably, even at this early point. The most fascinating derby for years is drawing closer.